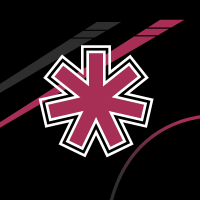 Myself and 11 other members created fictional college identities. Some were used from the original SCAA thread, while others were created brand new. 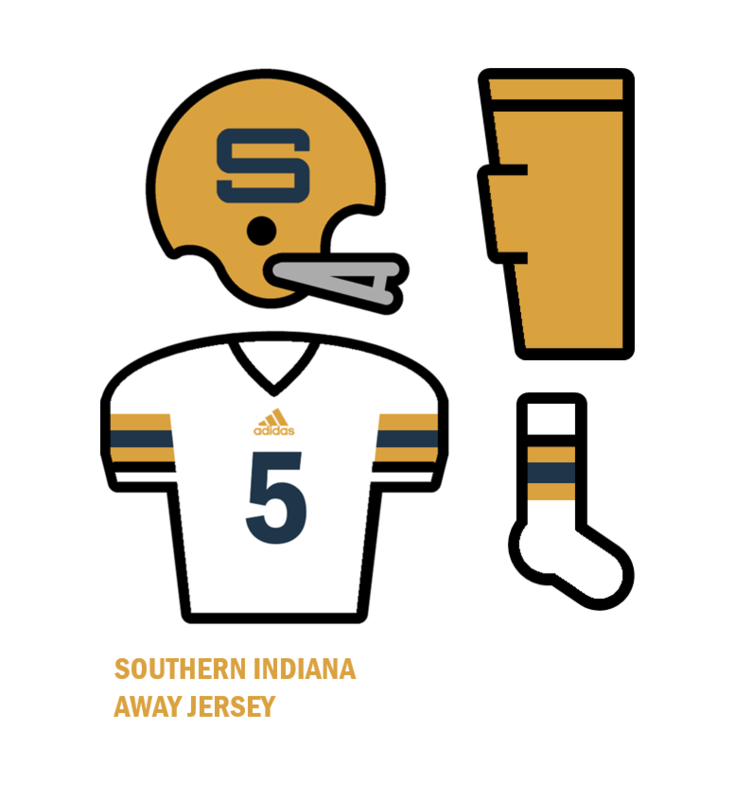 As well as sets of logos and backstories created for each college, we made football uniforms. From here, two conferences were created with 6 members in each. The Pacific Conference to the West, and the Continental Conference back East. Using these conferences, we made an eight game schedule for each team (5 conference game and 3 out of conference games). 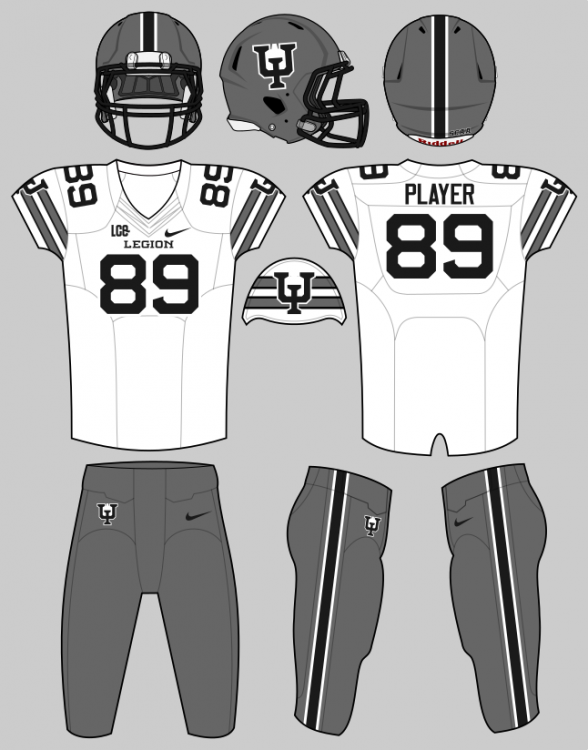 Every Saturday, 6 uniform matchups will be posted. These are the "games" in each week of the season. As well as posting the uniforms in this thread, a poll will be setup weekly to vote on the best matchups. Once these votes are counted, both teams in the first place matchup will be awarded 300 points, second place matchup teams will receive 200 points, and third place with 100 points. Additionally, each individual vote will awards 50 points to each team. At the end of eight weeks, the winner of the Pacific and Continental conferences, as well as the next two leading scorers from either conference, will participate in a 4 team playoff tournament. 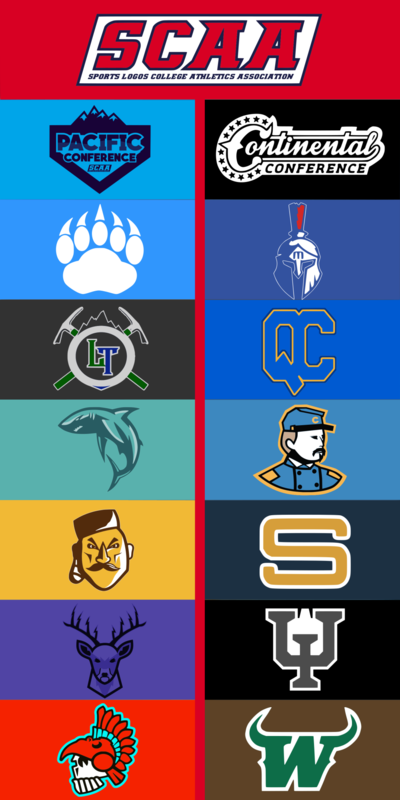 After these two matchups, the two winning teams will go head to head and ideally the best overall uniform should win! If only the members from each team voted, it could very well devolve into a Pirates of the Caribbean situation, with each person voting for their own teams. This is why your involvement can be so important, the more votes the better. I decided to start very small for a reason, and expansion is likely to be small and deliberate for that same reason. Now that that's all out of the way, here are your members and colleges of SCAA 2017! Lake Tahoe Tech University Sierra Guardians (Carson City, NV) @Pulv! Lake Tahoe Tech was founded in 1956 after South Lake University, also located in Carson City, defaulted due to not enough enrollements in the 1954/1955 academic year. Professor Florence Parker, who taught applicate physics in SLU, found out that the problem of the poor likability of his university was due to the absence of Engineering and practical studies carreers in it. For this reason Parker decided to found a new university in the Carson City urban area which was to be a polytechnic school. LTT sport dept. ever since 1957 had a team in almost every varsity sport they could think of. Although they had thousands of alumni playing dozens of different sports they never reached a single national championship in major sports. For this reason LTT teams were never feared from other universities. The only two sports in wich LTT teams are powerhouses are alpine skiing(1960, 1964, 1965, 1966, 1976, 1979, 1980, 1988, 1993,1996,1999,2004,2006,2013,2014,2015 national titles won) and sailing (1958, 1965, 1974,1975, 1982,1985, 1999, 2001,2007,2008, 2014 national titles won mostly in Finn and Hobie 16 classes). When it was time to chose a name for the sport teams, the uni council was strongly divided between the name Lakers or the name Trappers (Carson City is called after famous trapper Kit Carson) so in order to temper this big difference it was decided to give a name which was both linked to trappers and to the lake landscape. This is why they went with Sierra (for mighty Sierra Nevada) Guardians (meaning the mountain men guarding the sierra). Our story starts in 1961, when PTU was founded. Since then we've become a beacon of Portland culture, a powerhouse of collegiate sports, and the leading technical university in the great state of Oregon, despite being among the smallest major schools all along the west coast. This is not a disadvantage however, instead we view it as one of our biggest advantages since it's what gives the school an intimate, small town atmosphere while still being credited with making some of the country's biggest technological advancements. Now let us introduce you to a little something called a penny. Pennies are much, much more than just U.S. currency here at Portland Tech, after all they gave Portland it's name. They're everywhere here, from simple applications like notebook decorations and whiteboard boarders to crazy uses such as suits, hats, banners, and art made from 1¢ coins. The ultimate of these however is the Penny Mural, a sprawling wall of pennies that has been written on by thousands of students, faculty, and even some celebrities throughout the years. School spirit is everything here, all in the name of hard work, determination, and keeping Portland weird. 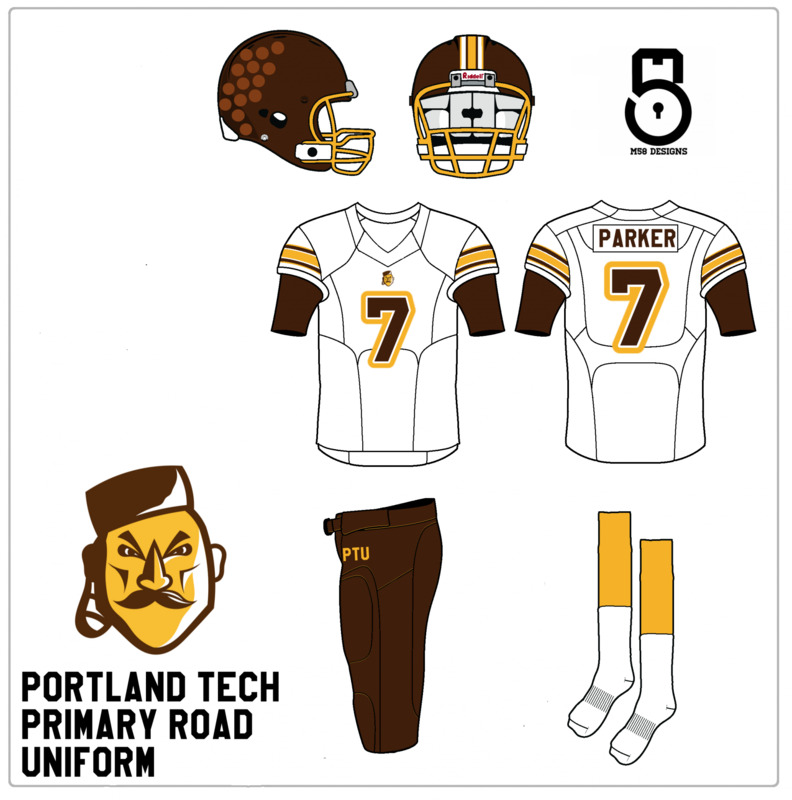 1963- The Portland Tech Pioneers played in their first ever intercollegiate football game, which ended in a score of 10-7 with PTU emerging victors. A game drenched with periods of heavy rain, there were no passing touchdowns and 4 missed field goals. However, the first successful attempt came with 1:42 remaining, putting the Pioneers up by 3 and icing their first victory as a football team. Portland Tech was sans mascot for the first six games of their inaugural season, before finally giving in to student demand and crowning their first pioneer mascot Pettygrove, named after the man on the side of the coin flip that gave Portland it's name. He was not much more than a man dressed up in a Davy Crockett costume bought at the local store, complete with coonskin hat and prop rifle. In fact that is all he was. Fans loved him though, and he's stuck around in various forms to this day. PTU ended up going 4-5 in season #1, but showed loads of promise that they had the means to become a serious contender someday. 1971- The infamous "Double-Fumble" took place, in which PTU running back George Davies fumbled the ball at his own 24 yd. line, fought to pick up the bouncing ball at the 31, carried the ball for 42 yards then fumbled the ball again at the opponent's 27 shrugging off a tackle, this time the ball being received by the visitor. This all happening with under a minute remaining in the 4th and the Pioneers poised to complete a 28 point comeback in the second half alone. They ended up losing the game 34-27 and it's considered one of the low points of Portland Tech football, but it will always be remembered by PTU and non-PTU fans alike. 1975- The number of games won in a row reaches 14 spanned over two seasons, a record that still stands for PTU football. The Pioneers won the 13th game of that series by a score of 53-6, their largest ever margin of victory at that point. 1982- The most iconic moment in the history of Portland Tech sports happened in 1982, when during a mid-season game students organized what became known as the "Penny Massacre". After their beloved coach Hy Bryant was fired after the 5th game of the year, the students planned a protest which involved throwing pennies onto the field at halftime. Planned problems were encountered, including preventing the band from performing and delaying resumption of gameplay, but a problem that wasn't expected was that some of the throws from the higher rows didn't make it to the field and instead hit some fans on the head causing injury, tens of those fans requiring medical attention. The season as a whole was a bust through and through with PTU going 1-9 and losing 6 of those games by 20 points or more. 2000- PTU running back Devon Robbins rushed for 311 yards and 4 TDs in 1 game, the same game WR Deacon Wright-Oliver scored a 90 yard TD and gained 151 yds overall. The Pioneers ended up winning by a score of 54-15. 2013- Portland Tech FG kicker Blake Webber hit the left upright not once, not twice, but three times in the second half. He redeemed himself though, with a clock beating kick to give PTU the victory by a score of 20-17. University of Santa Monica was founded in 1959 as a Catholic alternative to the secular, UC school system. Although it officially retains its affiliation with the church to this day, the school functions like a UC school on a daily basis. It's enrollment of 19,500 students places it on the smaller side, compared to it's main competitors in the metro Los Angeles area. USM is renowned for its diverse and energetic campus life. The University has adopted the culture of the Santa Monica neighborhood it is a part of, and has become a staple of the vibrant and forward thinking community. Walking through the central quad it is common to see students sprawled over the lawns, studying, throwing frisbees and playing beer die (best competition the west coast). The sports complexes, including football's Verde Stadium, are a stones throw away from the beach, Palisades Park, and the Santa Monica Pier. USM athletics play a crucial role in energizing the student population, and attendance is spectacular at all events. The "San Vicente Crazies", the student section at all home games, is known for extravagant displays of school spirit. The football team is known for its tremendous talent, but constantly under performs every year. With the past decade seeing increasing, stable success, expect big things from the Aztecas in 2017! As story goes, Frederick Harrison founded Mercy Valley University after seeing the prices of college across the Ohio River in Cincinnati, and wanted a cheaper, in-state school, that Northern Kentuckians didn't have to drive to Lexington for. This led to the founding of his new university, where many Kentuckians were drawn to. However, the students soon saw the flaws with the university, and began to complain about the lack of sports and activities. Harrison, who wanted to keep a successful college and positive environment, then built an athletics department, with sports like football, baseball, basketball, and soccer at the base. Since then, the programs have built from the ground up and are some of the best in all of the nation. Originally a blacksmith apprenticeship started by Isak Hansson in 1889, the University of the Iron is based in Hibbing, Minnesota in the heart of the Iron Range. Known for having some of the largest iron mines in the world, the Iron Range was the perfect spot for Hansson to teach aspiring blacksmiths the trade. Eventually the apprenticeship was expanded and Hansson began employing more instructors and teaching different trades such as welding, and iron-working. By the turn of the century, Hansson had become the president of what was then called the Minnesota School of Metal. At the beginning of the United States' involvement in World War II President Isak Hansson died after serving as the head of the establishment for more than fifty years. World War II proved to be a spark that helped the school grow as hundreds of men and women flocked to the school to learn how to weld and iron-work. Many of the tanks used by the United States were assembled in Hibbing thanks to the help of the students and faculty. A few decades later after the industry had died down the school struggled to keep a steady enrollment. The school was forced to cut all athletics including their famous hockey team which had seen the names of the famous "Iron Line" from the 1980 US Olympic Men's Hockey team on the back of their sweaters. Mark Pavelich, John Harrington, and Buzz Schneider all broke numerous records as they went on to win six straight NCAA Championships from the 1974-79 seasons. So by 1982 the athletic department had been de-funded and the money was spent on expanding the school's specialties. In 1982 mining engineering was now offered at the newly renamed "University of the Iron". With the addition of this new profession, the school saw dramatic increases in enrollment and endowment. The name change was meant to represent a new age for the school and for the inhabitants of Hibbing. With the urbanization of the Twin Cities and the United States in general, the school began to flourish as more and more high rises and larger projects were constructed. In 1985 the athletic department got its funding back and the town of Hibbing got their beloved Legion back. Now seen as one of the top-producers of highly skilled hockey players and large nimble offensive linemen, Hibbing is enjoying the success of their small town team. Buffalo Creek Teachers College was founded in 1929, to act as a more secular and liberal alternative to Waxahachie's other academic center, Trinity University (now in San Antonio). Buffalo Creek Teachers College focused not only on the pursuit of knowledge, but passing that knowledge on to the next generation of young Texan minds. BCTC became an epicenter for training teachers that would go on to make names for themselves all around the state. In 1967, Buffalo Creek Teachers College officially rebranded itself as Waxahachie State University. 1970 saw the first and only season of collegiate sports in the history of this highly regarded academic institution, as the Waxahachie State Buffaloes football team would struggle to a woeful 0-10 record, scoring only 2 touchdowns all season. Interest in the program never really took off, and the athletic department was cancelled after the inaugural season. 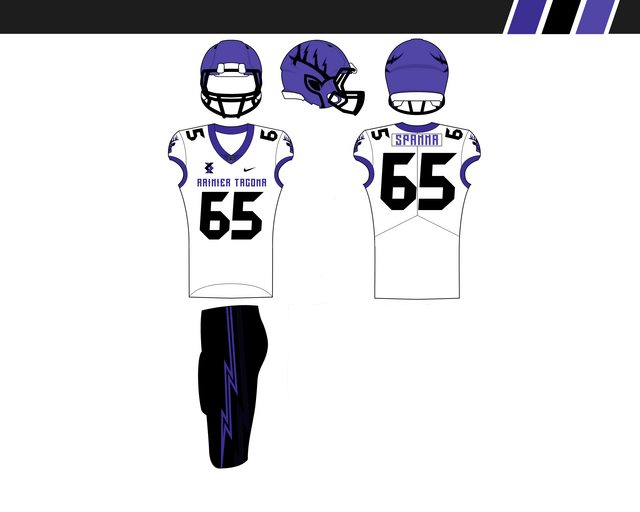 After decades of rumors and rumblings, and a sizable donation from some very successful alumni, the Waxahachie State University Buffaloes will be returning to action in the fall of 2017, for the first time since the 1970 season. Spoilers were added for some teams, will be continued and added to! Glad to see the SCAA back on the forums! It was fun the first time around. Hopefully my Wisconsin State French can make a comeback in this sometime in the future. I'm glad this is back!! Be sure to catch Week 1 Gameday tomorrow morning! I will posting the matchups and opening polls which will be up through Saturday and Sunday. Spoilers were added to some teams with background, stay tuned. Man this is great, hopefully my team from the original thread can make the expansion. Man, this should be fun. Good luck to the Big Dozen. Good morning, and welcome to the inaugural SCAA Gameday! We are live from the studio in Phoenix, Arizona to present the slate of Week 1, non-conference matchups we have today! There are plenty of intriguing games to look at, but first let's get the perspective from our first guest speaker, president of Mililani University, @ZionEagle! sleuthpanther: Just looking at what's in store today, what matchup catches your eye at first glance? ZionEagle: There's a lot of potential as far as games go this week, but I have to hand it to AJSU and UTI. Two classic, clean jerseys and two strong team identities. 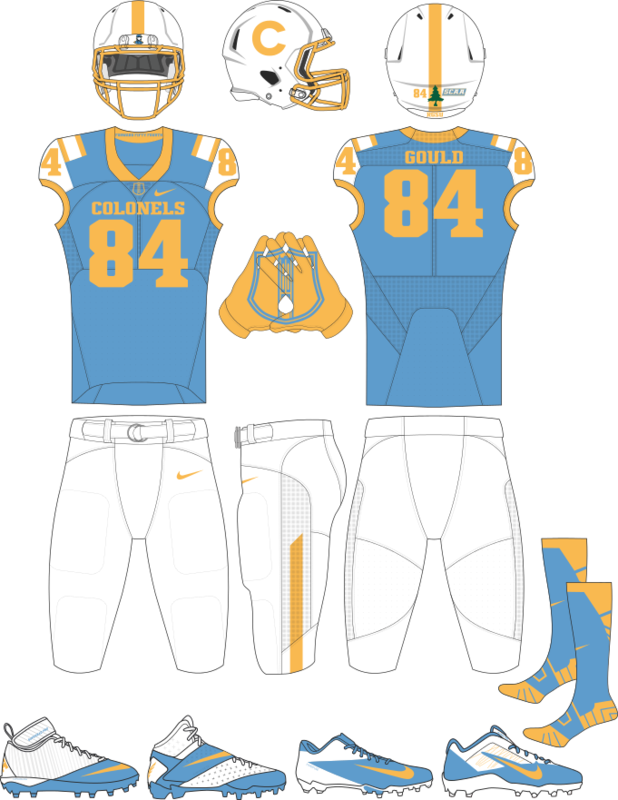 I would expect it to be the best uniform matchup so far. sleuthpanther: It should be a great looking game, but I've heard AK Juneau has a few sneaky alternates up their sleeves that could change the pace of the game. While we have you here, would you care to tell us something about Mililani that we might not know? ZionEagle: Well, here's an interesting bit of trivia about MU that you may not know. When we first started our athletics program 4 years after our founding, which was in 1978, our athletics program was having trouble deciding on an appropriate mascot for the university. The students decided that they wanted to honor our recently deceased founder, Hanale Anderson, by naming our sport teams after his aumakua (family god). In accordance with this, our mascot became the Mano, or shark as it is known in English. 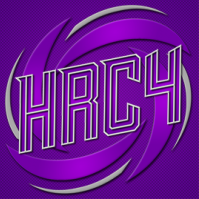 Thanks for your time, and good luck to all the teams out there! sleuthpanther: A lot of great tradition behind some of these programs, thank you so much for your time and good luck today! Now let's look at what we have on the schedule for today. In what was expected to be a meeting of fairly traditional sets, the Legion makes the trip up to the Far North to open up their season against the Kodiaks. 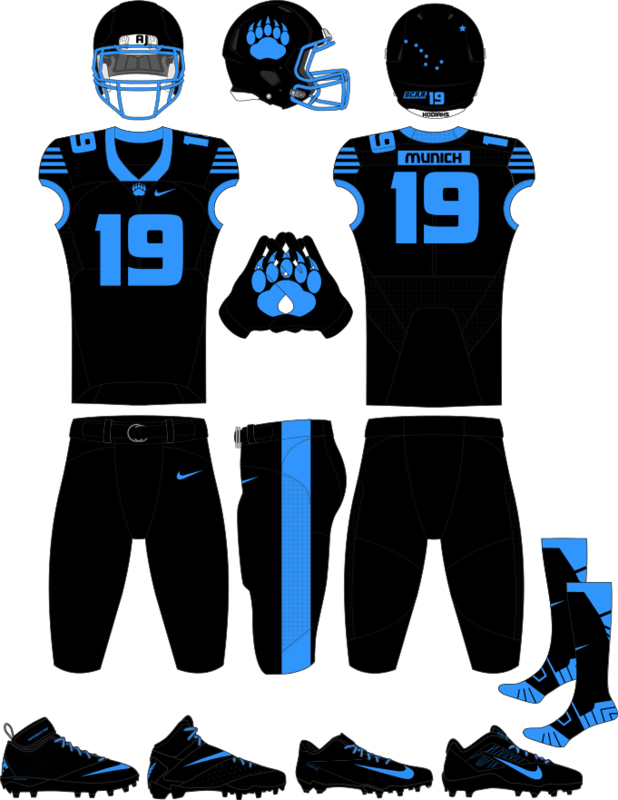 However, in their home opener the Kodiaks surprised many with their "Blackout" set. 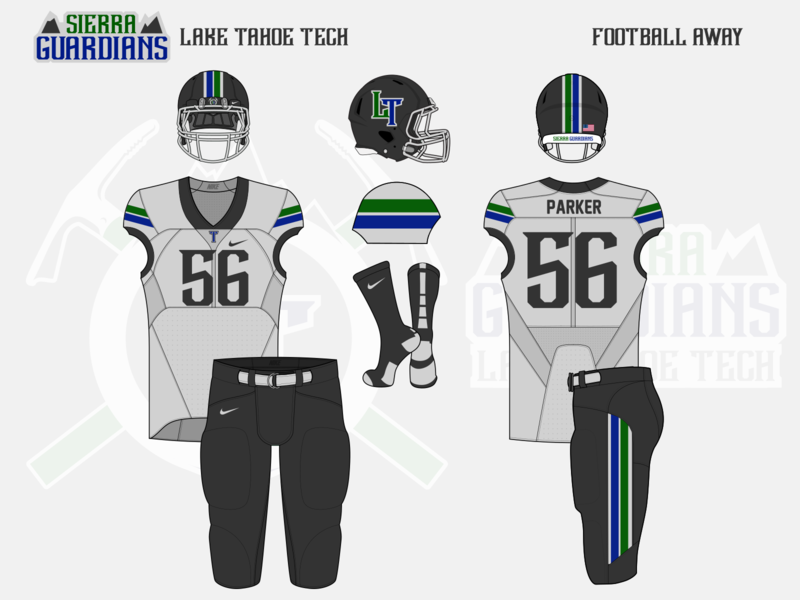 The Titans play host to LTTU in Covington in a standoff between two cutting edge designs. 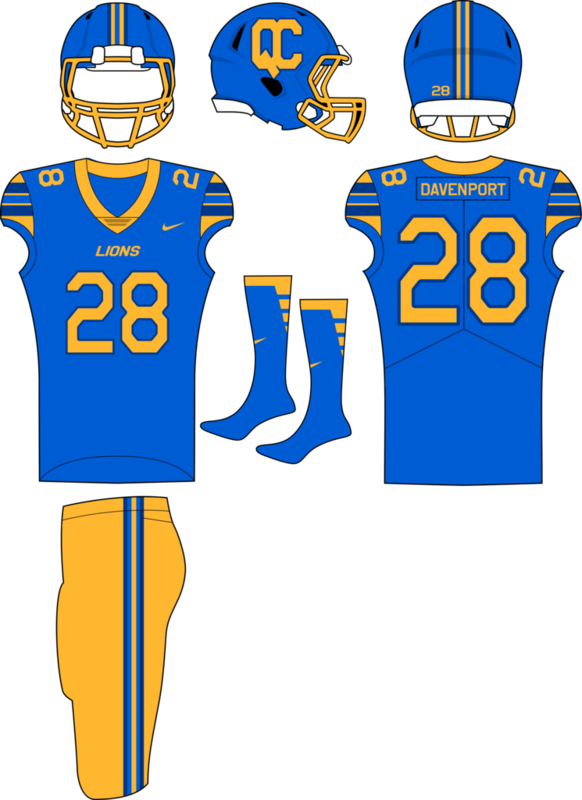 Mercy Valley's royal blue was ruled to contrast enough with LTTU's glacier gray away set. USI travels 4000 miles to visit Mililani, Hawaii in a complete clash of traditonal vs. modern. As expected, the contrast of era designs is extreme. The Colonels and Pioneers square off in a battle of deceptively simple sets. Both teams stuck with their traditional sets, with the penny-clad helmets of PTU making their scheduled appearance. The Thunder charge through the cornfields of Iowa to meet up with Quad City in an entertaining clash of styles. 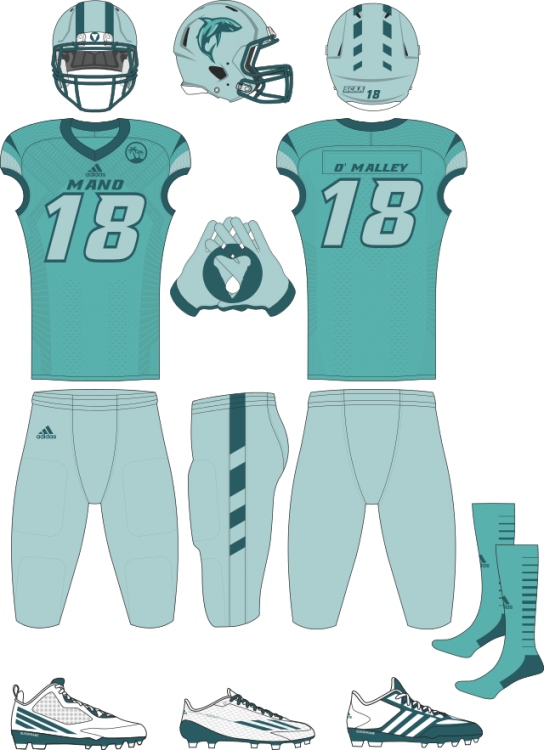 As expected, both the color scheme and and designs of both teams were fun to look at. 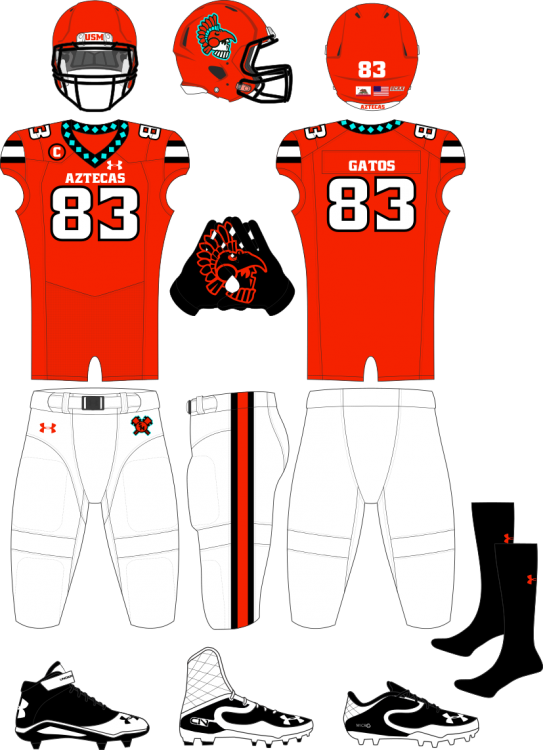 The Aztecas welcome Waxahachie State to the West Coast in a flashy display of traditional design. It's always interesting to note that Wilson has held onto the contract of such a profile team as WSU in this era. Thank you to all the members of SCAA for helping kick this season off, hope you guys enjoy and get over to the Poll section and put your votes in! @sleuthpanther how did you post the original SCAA without it getting locked (until now for inactivity). When I started something like this, it got locked. I started off the thread with my own concept and everything. We specifically asked for the go ahead from the mods before starting again. 1) If there's ever a chance to expand the league, please let me know because I have an idea for a school. 2) These are supposed to be fictional universities, right? Because there is a University of Southern Indiana, the Screaming Eagles, just outside Evansville. I'll be closing the poll in a few hours and its a tight race, so get those votes in! We'll see how the season goes before thinking too hard about expansion. I mean they should be, although they share a name the identity and location is pretty different so I think it's fine. Long Live North Eastern New York Bulls! Excited to see the league back, hopefully NENY will somehow return to competition. The major difference is that sleuthpanther did all the recruiting beforehand. Other threads of a similar nature have been based on a singular design, then requested help for the other "x" amount of teams to complete the league. 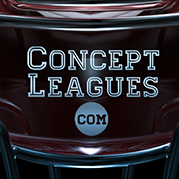 The whole purpose of the concepts forum is to showcase artwork, not post one thing and have everyone else finishing it. Collaborations can be done here, just do the legwork behind the scenes. For a scoring review, first place received 300 points, second place received 200, and those in third received 100. Additionally, each team received 50 more points per individual vote. Thanks for all those that participated in the voting, they made a difference! Also a reminder, THIS IS STILL A CONCEPT, COMMENTS AND CRITICISM ARE NECESSARY. TELL US WHY YOU LIKED A SPECIFIC UNIFORM OR WHAT CHANGES YOU THINK COULD BE MADE. Since you aren't making any concepts I suggest you at least make a formal, good looking standings board. 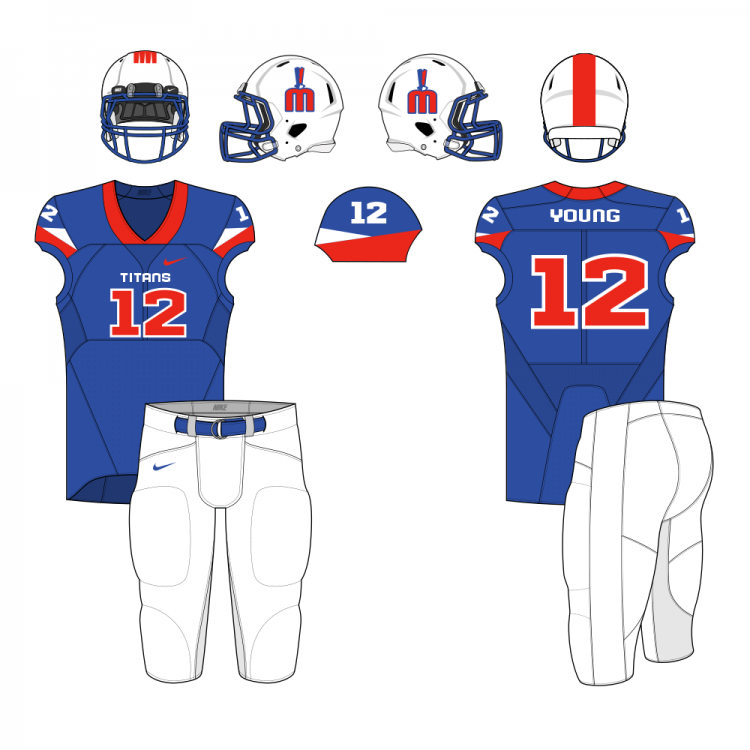 With logos and other stuff like that because looking at the name I'm not sure what team belongs to what school. Did I miss a vote? Or was it done elsewhere?